6,200 cars will be sold for export in 2016. KAMAZ has lowered its export estimates for 2017, largely because of shrinkage in the size of markets of CIS countries, but expects to raise revenues from domestic sales and expanding markets in Africa, Latin America and Southeast Asia. While the Ministry of Industry and Trade plans to increase the export of cars in 2017, KAMAZ plans to sell 6,000 cars in foreign markets next year, or 200 units less than in 2016. This year’s export forecasts have also not been realised. Another major manufacturer, GAZ Group, spoke about difficulties to develop exports. Nevertheless, analysts believe Russian producers have a chance to gain a foothold in a number of foreign markets and overall, the yearly forecast is "moderately optimistic". KAMAZ plans to sell 36,000 cars in 2017: 30,000 in the domestic market, 6,000 for export, according to business plans released earlier this week. The sales forecast for 2016 provided for sale of 33,500 vehicles, of which 6,500 were for exports, showing an expected decline in external sales. KAMAZ, however, expects an improved financial performance in 2017, forecasting a net profit of 1.2 billion roubles and total revenue of 143 billion roubles. (The forecast by the end of 2016 is 150-200 million and 125 billion roubles, respectively.). KAMAZ representatives informed Kommersant representatives that 6,200 cars will be sold for export in 2016, so the company does not expect a significant drop in 2017 indicators. The main reason for decline in external sales is reduction of markets in CIS countries. Also, supplies to Ukraine have practically stopped. KAMAZ representatives added that they managed to maintain exports in 2016 because of a significant growth in sales to foreign countries like Vietnam, Cuba and countries in Latin America, and Africa (where they have doubled). The expected earnings and revenue growth at KAMAZ is associated with an increase of 2,000 units in domestic sales. The GAZ Group has not disclosed plans for exports in 2017, but said that they expected a sales growth abroad. Exports accounted for around 22% of total shipments in 2016, about the same as last year, said Vadim Sorokin, head of the company. Elena Matveeva, Vice President of GAZ Group told Kommersant that the main obstacle to exports was the high level of costs in creating technology for countries with specific requirements, with the current lending rates required for R & D investment being "overpowering." For 2017, she said neither the Ministry of Industry and Trade, nor Russia's export centre, "in a strange case have not provided for" the funds in the budget to subsidize research and development and modernization of the export models. She connects the success of export plans with the Government’s consistency in the implementation of the support programmes (they could reach 12 billion rubles in 2017, said a Kommersant source). Although the truck market has been growing for eight consecutive months (according to AUTOSTAT, sales increased by 32% to 5,500 in November), in recent years the demand has greatly reduced. In its strategy for development of the automotive industry, the Industry and Trade Ministry expects to maintain production volumes through exports. Andrei Chursin, chairman of AEB commercial vehicles Committee, said the forecast for 2017 looks "moderately optimistic" for truck manufacturers. A slight recovery in the economy is outlined: GDP growth, stabilization of the ruble exchange rate, reduction in the rates on loans, as well as a large pent-up demand accumulated during the crisis years. According to him, the market share attributable to domestic producers peaked in the first half of 2016, and in 2017, a gradual increase in the foreign manufacturers’ share of sales is expected. 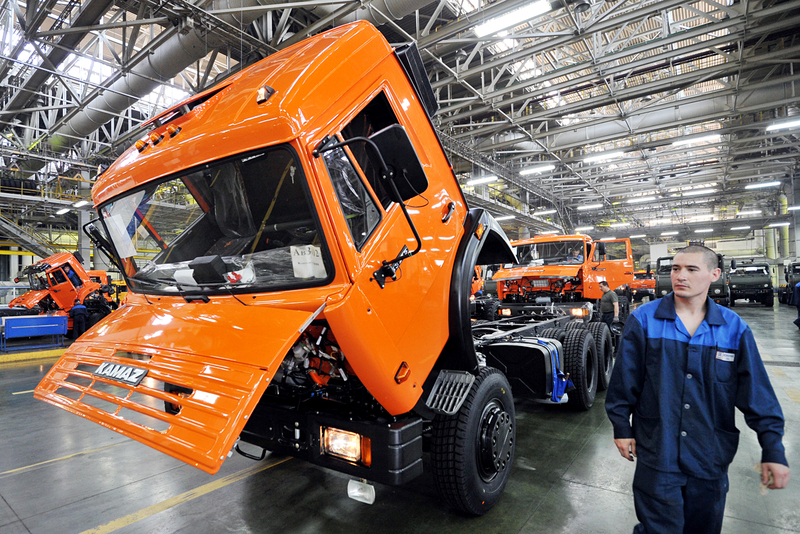 Vladimir Bespalov from VTB Capital, said the reduced exports planned by KAMAZ is primarily due to lower sales expected in Kazakhstan against the background of general market contraction in that country. According to Bespalov, Russian manufacturers of trucks should increase export sales over the next few years because of both government support and a greater focus on foreign markets - Latin America, Africa and Southeast Asia.